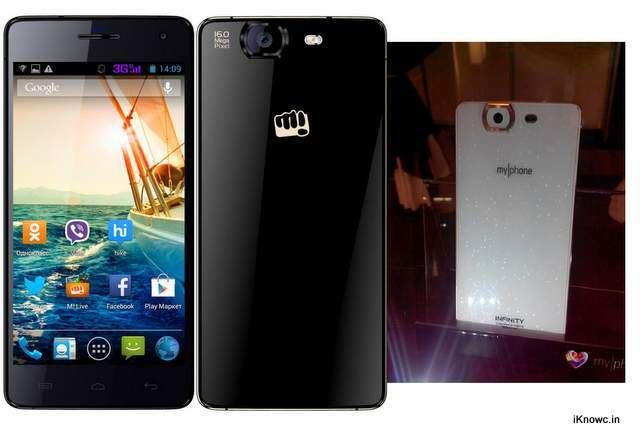 Micromax has recently launched there latest flagship android smartphone, the Canvas Knight in Russia. Now the same handset has been announced in Philippines dubbed as Myphone Infinity. Both the handsets are manufactured by some third part manufacturer. The Micromax Canvas Knight A350 and Myphone Infinity Octa core comes with some top specs. The handset is powered by 1.7GHz quad core processor paired with 2GB of RAM. It has 5 inch 1080p Full HD display with 441 ppi (pixels per inch) and Mali 450 GPU. The handsets packs with a16MP Auto focus rear camera with LED flash and a 5MP front camera. The Myphone infinity has DUAL SIM support and runs on Android v4.2 Jelly bean OS. There is 16gigs of internal storage (ROM) and up to 32GB expandable storage. It features 3G, WiFi, Bluetooth, Fm radio, GPS and micro USB with OTG. There is 2350mAh battery to power the handset. The price of the phone is not announced yet. Micromax has started teasing the A350 Knight and would launch it in mid of this month.